All images courtesty Mark Sublette Medicine Man Gallery, Tucson, Ariz. and Santa Fe, N.M. uless otherwise noted. Silver bolo (string tie), featuring exceptional turquoise from the Morenci, AZ, mine, c. 1960, bolo 3.5” x 2.75”, leather 23.25”, 186 grams, stones at tips measure 1.5” x 1.125” and 1.125” x 1.125,” $1,500. Charley Billy, as a youth, spent summers on the “Big Rez” Navajo reservation near Chinle, Ariz. He recalls that his grandfather, a medicine man, always wore his silver hatband, bolo, belt, ring and bow guards while performing elaborate healing ceremonies. Although there is no connection between silver and Navajo religious belief, all that shimmer inspired respect, trust and power. Navajos evidently settled in the Southwest in the 1400s. Silver craft was introduced a century later, when Spanish Conquistadors arrived atop steeds boasting decorative silver bits and bridles. Like the Moors who had formerly ruled Spain, they believed that this shiny metal warded off the Evil Eye. Local blacksmiths, impressed by Conquistador finery, soon created similar items of their own, often trading them for Navajo cattle. After mastering basic blacksmithing skills in the 1850s, Atsidi Sani, a medicine man and blacksmith known as the father of Navajo craft, also tried his hand at silverwork. Between 1864 and 1868, while his tribe was incarcerated at Fort Sumner, N.M., his sons mastered the trade as well. Upon return to their homeland, many Navajos adorned their horses with silver bits and decorative plaques. Roped and beaded silver and turquoise ring, by B. Betony, c. 1960, size 8.75, $95. Initially, Navajo silversmiths forged rude files, dies, stamps and shears from discarded scraps of metal, or acquired them through trade. For lack of raw material, they melted United States silver dollars, fifty-cent pieces and quarters in rounded metal or pottery crucibles. Some craftsmen cast silver objects in wax, ash-rock or carved sandstone molds. Others cast rough ingots, pounding them into thin sheets, fashioning them into geometric shapes with shears or chisels, then polishing them with sand or ashes. Pieces that required soldering were simply placed on hot coals alongside brass and silver filings, and then heated with blowpipes or goatskin bellows. Many early silver pieces, measured by eye and cut by hand, bear decorative gash and groove chisel work accents. Others, like finger rings, earrings, belts, buttons and bracelets, feature crudely stamped, etched, or raised designs. Because all were solid silver, they were exceedingly heavy. Silver hatband, featuring repetitive "sunburst" stamps, c. 1960, circumference 21.125", bandwidth .5", buckle .75" x 1.375", $265. Navajos also acquired popular Colonial-made silver trinkets from Eastern tribes through trade, looting and warfare. Thus, despite clear Moorish, Mexican and Spanish influence, some of their early pieces resemble traditional English silver. Silverwork technique improved dramatically in the 1880s, with the establishment of Reservation trading posts run by Anglo-Americans. These “mini-markets” not only supplied the tribe with basic amenities, but also stocked artisan tools, including ready-made files, emery paper, anvils, chisels, dies, pliers, scissors, stamps, tongs and commercial polishing substances. Finer pieces followed, featuring stamped mythical images or elaborate curved, geometric or linear patterns. 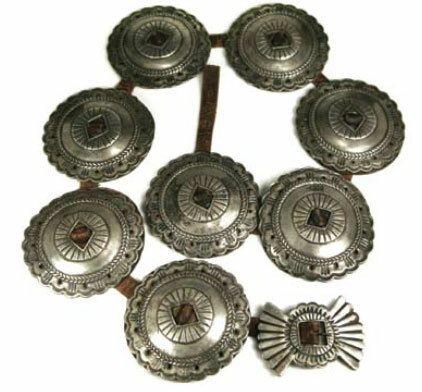 Small, repeating, stamped “sunbursts,” another popular motif, commonly adorned conchos, large, domed, shell-like silver disks. To this day, silver conchos of all sizes and variations decorate pins, bow guards, bolos, belt buckles or are decoratively strung through slots on leather belts. Large, rounded beads gave way to finer oval or fluted ones, commonly strung between shanked coins. Coins themselves, pounded into domes, also served as beads or buttons. Heavy squash blossom “beads that spread,” which resemble young pomegranate flowers, remain favorites. Necklaces that feature squash blossom beads often star heavy, large, sand-cast najas, half-moon shaped, Moorish-style good luck amulets as well. Turquoise bead and “sunburst” stamped silver bracelet by H. J. Gray, c. 1970, size 7.5”, to include a 1.625” gap,108 grams, marked H. J. Gray, $450. As transcontinental railroads criss-crossed America in the 1870s, introducing Native American crafts to the general public, demand for Navajo silver grew. From then on, trading posts not only supplied artisans with tools, but also purchased their finished products, marketing them to tourists and collectors. Even today, silver jewelry increases a Navajo’s power, offers financial security and raises his social status. So pieces sometimes remain within extended families, passing from cousin to cousin over generations. When the need arises, however, Navajos pawn their silver treasures at trading posts. In return, they receive groceries, clothes or cash. Though the word “pawn” may elicit visions of poverty, this type of “pawning” is an integral part of Navajo culture. Farmers, for example, might trade silver-heavy concho belts for seed money, redeeming them after sheep shearing or harvest. Women might swap strands of fluted silver beads for festive bolts of velvet. Medicine men might redeem silver hatbands, rings and bracelets in time for summer ceremonials. When the good times are over, however, their treasures usually return to the trading post pawn racks - until the next time around. If these heavy “old” pawn pieces, some dating to the late 1800s, are unredeemed within agreed periods, they become “dead” pawn. Traders may then sell them at a profit to the public. Unredeemed pawn pieces are not only highly collectible, but being solid silver, quite costly. Silver and leather concho belt, featuring stamped “sunbursts,” embellished with roped and repeating curved designs, c. 1960, 42.5” long, buckle 2.5” x 3.5,” conchos 4” x 4,” weight 3.3 pounds, $5,600. Silver kachina-doll shaped overlay earrings and pin, c.1960, earrings 1-7/8” x 5/8”, pin 2-1/4” x 3⁄4”, $140. Collectors can expect to pay hundreds to thousands of dollars, for example, for a one-of-a-kind, quality old pawn Navajo belt or bracelet, depending on its weight, age and condition. An early silver concho- heavy belt may command many times more. Pieces with pawn tickets intact too are especially desirable. Simple contemporary pieces, those dating from the 1980s, are available for around $100. High quality contemporary works by well-known artists, which feature large amounts of silver in complex, innovative designs, however, generally command several hundred to several thousand dollars each. This valuable mineral, which is mined across the southwestern United States, has long been part of Navajo mythology and culture, holding special powers. Once during a curing ceremony, for example, Charley’s grandfather pierced the boy’s ears, inserting turquoise nuggets suspended from string. They stayed until the strings broke... all part of the cure. In the distant past, these blue-green “sky stones,” symbols of heavenly purity, figured in mosaics, small sculptures and beads. 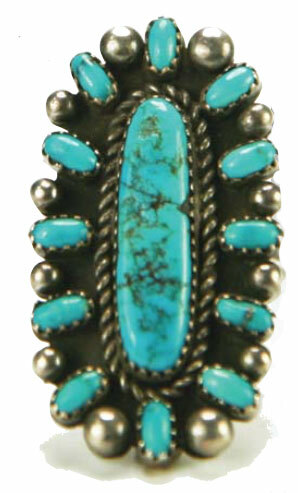 Later pieces featured domed silver dimes and quarters alternating with turquoise nuggets. 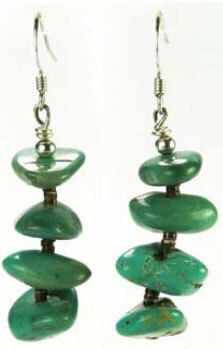 Earrings featuring free-form turquoise nuggets alternating with small, tube-shaped heishi beads, c. 1960, 2", $80. In 1890, when defacing or melting coins became a US Federal offense, trading posts secured softer, easier-to-work Mexican silver pesos for local silversmiths. By the turn of the century, traders realized that Navajo jewelry, distinctive, portable and strongly associated with the Southwest, held great commercial potential. Solid silver pieces proved too heavy and expensive for the general market, however. So in the 1920s, when ready-rolled sheet silver replaced slugs and coins, silversmiths began creating smaller, lighter versions suited to the tourist trade. Growing demand eventually led to mass production methods, which favored low cost over quality. Because Navajo smiths assembled mass-produced components, however, they were marketed as authentic Navajo jewelry. Though sales plummeted during the Great Depression, the Navajo silver market began to recover by the 1970s. Today, silversmiths produce traditional items like squash blossom necklaces, turquoise-studded pins and mother-in-law bells, which, by tinkling, warn sons-in-law of their impending arrivals. They also create specialized items like tie tacks, cufflinks, money clips, barrettes and watchbands - even collar corners that accent fashionable velveteen blouses. Because silver jewelry is created by Navajos, for Navajos, it embodies both their personal history and tribal art. 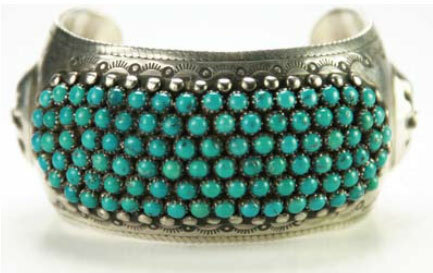 Silver also continues to symbolize Navajo wealth, status and self-esteem. Thus, from a baby’s first chortle until the end of her life, silver is the perfect gift. 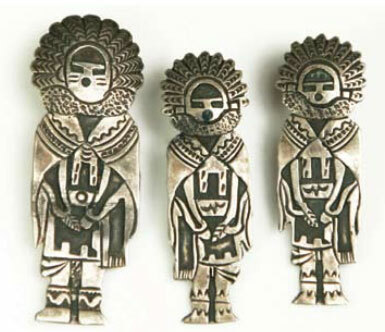 Today, old or ailing Navajos commonly give away their silver jewelry, to avoid the weakness, nightmares and terrors of “ghost sickness,” caused by ghosts of the departed. Yet it was not always so. Charley’s grandmother, a dreamer and hand-trembler able to identify sources of illness, owned thousands of dollars’ worth of silver jewelry. “Even the buttons on her coat,” he recalled, “were domed silver ‘Walking Liberty’ dollars and Mercury dimes.” He wonders if, like so many, she took all those treasures to the grave.